Is AgroFresh Solutions Inc (AGFS) A Good Stock To Buy? At Insider Monkey we follow around 700 of the best-performing investors and even though many of them lost money in the last couple of months (70% of hedge funds lost money in October whereas S&P 500 ETF lost about 7%), the history teaches us that over the long-run they still manage to beat the market, which is why it can be profitable for us to imitate their activity. Of course, even the best money managers can sometimes get it wrong, but following some of their picks gives us a better chance to outperform the crowd than picking a random stock and this is where our research comes in. AgroFresh Solutions Inc (NASDAQ:AGFS) has seen a decrease in enthusiasm from smart money in recent months. AGFS was in 8 hedge funds’ portfolios at the end of the third quarter of 2018. 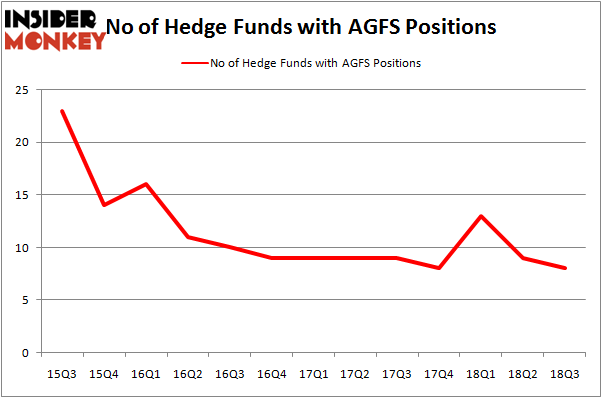 There were 9 hedge funds in our database with AGFS positions at the end of the previous quarter. AgroFresh wasn’t one of the 30 most popular stocks among hedge funds. To most shareholders, hedge funds are assumed to be unimportant, outdated financial vehicles of the past. While there are greater than 8000 funds trading today, Our researchers hone in on the masters of this club, approximately 700 funds. These investment experts direct the majority of all hedge funds’ total capital, and by paying attention to their finest investments, Insider Monkey has deciphered a few investment strategies that have historically outstripped the S&P 500 index. Insider Monkey’s flagship hedge fund strategy surpassed the S&P 500 index by 6 percentage points a year since its inception in May 2014 through early November 2018. We were able to generate large returns even by identifying short candidates. Our portfolio of short stocks lost 26.1% since February 2017 even though the market was up nearly 19% during the same period. We just shared a list of 11 short targets in our latest quarterly update. Let’s take a look at the recent hedge fund action regarding AgroFresh Solutions Inc (NASDAQ:AGFS). What have hedge funds been doing with AgroFresh Solutions Inc (NASDAQ:AGFS)? At Q3’s end, a total of 8 of the hedge funds tracked by Insider Monkey were bullish on this stock, a change of -11% from the previous quarter. On the other hand, there were a total of 8 hedge funds with a bullish position in AGFS at the beginning of this year. So, let’s examine which hedge funds were among the top holders of the stock and which hedge funds were making big moves. The largest stake in AgroFresh Solutions Inc (NASDAQ:AGFS) was held by D E Shaw, which reported holding $1.5 million worth of stock at the end of September. It was followed by Ionic Capital Management with a $0.9 million position. Other investors bullish on the company included Ardsley Partners, Highbridge Capital Management, and Levin Capital Strategies. Judging by the fact that AgroFresh Solutions Inc (NASDAQ:AGFS) has experienced falling interest from the entirety of the hedge funds we track, we can see that there exists a select few hedge funds that decided to sell off their full holdings by the end of the third quarter. Intriguingly, Ken Griffin’s Citadel Investment Group dropped the largest position of the 700 funds followed by Insider Monkey, valued at close to $0.6 million in stock, and Bart Baum’s Ionic Capital Management was right behind this move, as the fund sold off about $0.5 million worth. These transactions are important to note, as aggregate hedge fund interest fell by 1 funds by the end of the third quarter. Let’s now take a look at hedge fund activity in other stocks similar to AgroFresh Solutions Inc (NASDAQ:AGFS). We will take a look at Blackrock Muniyield New Jersey Fund Inc. (NYSE:MYJ), Japan Smaller Capitalization Fund Inc (NYSE:JOF), Peoples Financial Services Corp. (NASDAQ:PFIS), and BioLife Solutions, Inc. (NASDAQ:BLFS). This group of stocks’ market values resemble AGFS’s market value. As you can see these stocks had an average of 4.75 hedge funds with bullish positions and the average amount invested in these stocks was $24 million. That figure was $4 million in AGFS’s case. BioLife Solutions, Inc. (NASDAQ:BLFS) is the most popular stock in this table. On the other hand Peoples Financial Services Corp. (NASDAQ:PFIS) is the least popular one with only 1 bullish hedge fund positions. AgroFresh Solutions Inc (NASDAQ:AGFS) is not the most popular stock in this group but hedge fund interest is still above average. This is a slightly positive signal but we’d rather spend our time researching stocks that hedge funds are piling on. In this regard BLFS might be a better candidate to consider a long position.